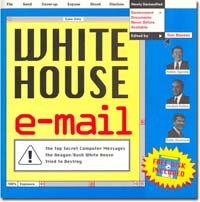 "GOP Halts Effort to Retrieve White House E-Mails"
"Expert details White House e-mail risks"
"Recovery of missing e-mails would be costly, says White House official"
"Report: NARA doubted White House e-mail archives in 2004"
Washington DC, February 26, 2008 - At a hearing today before the House Committee on Oversight and Government Reform, it was disclosed that the White House has received repeated warnings from the National Archives and Records Administration (NARA) and from information technology experts within the White House about the risk of lost e-mails. Records obtained by the Committee showed that NARA's warnings began as early as January 2004 and that the White House was aware of the danger that e-mails may not be properly preserved. Further, testimony and evidence indicated that a new records management system was developed by the White House and NARA and then rejected by White House Office of Administration Chief Information Officer Theresa Payton in the fall of 2006, when the system was ready for implementation. The existing archiving process, which was installed as a temporary solution in 2002, was "primitive," according to a former White House technology expert in communications with the Committee. "The White House's witnesses disclaimed knowledge and responsibility for the e-mail problem. The NARA witnesses said that they are waiting for the White House to take action. But no one is doing anything and time is running out," commented Meredith Fuchs, General Counsel to the National Security Archive. Excerpts of records released by the Committee during the hearing included a letter from Archivist of the United States Allen Weinstein to White House Counsel Fred Fielding, dated May 1, 2007, stating that it is "essential that the White House move with the utmost dispatch . . . in taking whatever action may be necessary to restore any missing e-mails." The records of the George W. Bush presidency will be transferred to NARA in January 2009, just eleven months from now. But an internal NARA memorandum from September 5, 2007, stated that "zero progress" had been made in planning for the transition and that NARA "still know[s] virtually nothing about the status of the alleged missing White House e-mails." Ms. Payton refused to provide an estimate of when her office will complete both the analysis of whether e-mails are missing and any necessary recovery effort, and specifically acknowledged that such recovery may not be completed in time for the White House transition. She stated only that White House staff are currently carrying out phase one of a three-phased process to identify missing e-mails and implement necessary restoration efforts, and that preliminary findings showed a reduction in the number of days with no EOP e-mails preserved from 473 (identified in 2005 OA analysis) to 202. In a declaration submitted on January 15 in a lawsuit brought by the National Security Archive against the Executive Office of the President, Ms. Payton stated that the White House began saving its backup tapes in October 2003 in response to concerns about its e-mail archiving system, but that the tapes had previously been recycled regularly. Ms. Payton testified that the disaster recovery backups present only a snapshot of the applications and data on the systems at the time of the backup. Her testimony and the declaration recognize that the backups may not be complete. "In addition, we are still worried about the e-mails that are missing from before October 2003. No one said anything about those e-mails today," noted Meredith Fuchs.